HealthPostures announces that it recently entered into a dealership agreement with New York based Ergo Design Solutions. "Commitment to a healthier work style, easy to use ergonomic tools and to making quality products right here in America is what sets HealthPostures apart, not only from other ergonomic firms but from many other companies as well." HealthPostures, respected provider of workplace furniture and equipment solutions, announces that it recently entered into a dealership agreement with Ergo Design Solutions. Ergonomics equipment that HealthPostures makes include adjustable chairs, monitor mounts, desk clamps, mounting brackets, monitor arms and seat extensions. Designers at HealthPostures purpose to develop and distribute products that increase mobility for adults while they are at work. 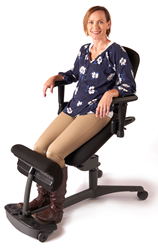 Increased mobility and back and neck support are gained with HealthPostures' products like the 5100 Stance Angle, TaskMate Journey, 6100 TaskMate Executive and the 5000 Stance Move. The company's new dealer, Ergo Design Solutions, consults with organizational leaders, advising them on effective workplace solutions that could help to alleviate their workers' musculoskeletal discomforts. Ergo Design Solution founder, Anton Borissov, shared that there were three leading factors that caused him to decide to partner with HealthPostures. Those three factors are top notch customer service, caring attitude and product reputation. When asked what sets HealthPostures apart from other ergonomics' companies, Anton said that, "I believe that HealthPostures truly focuses on the needs of the end user, whether that is a regular office worker, a home user or a busy healthcare professional." Anton added that, "HealthPostures achieves this through its incredibly designed TaskMate series of products. The commitment to a healthier work style, easy to use ergonomic tools and to making quality products right here in America is what sets HealthPostures apart, not only from other ergonomic firms but from many other companies as well." Inspiration to start Ergo Design Solutions came after Anton developed a condition known as cervical disk herniation. After several months of suffering, Anton sought medical advice. Doctors asked him what he did for a living. After telling doctors that he worked in an office and spent the bulk of the day sitting, Anton says, "To my surprise, my orthopedic surgeon explained to me that prolonged and incorrect sitting while doing computer work often results in the neck injury that I had." Anton continues, "This incident inspired me to seek innovative and healthier ways of designing workspaces. Eventually, I started my own ergonomic office products company, Ergo Design Solutions." Anton has since found that there are hidden costs of lowered productivity and hidden health risks in workspaces that are not ergonomically equipped. The HealthPostures partnership aims to meet this need. HealthPostures LLC (https://healthpostures.com) specializes in the design and development of workplace solutions. The firm also manufactures safety ergonomics products and equipment. For nearly 20 years, the Midwest headquartered company has built the equipment that is helping people to stay healthy while they work. A key mission of HealthPostures' is to "strive to provide quality products that will help transform your sedentary life so you have a healthy way to work." Office solutions sit stand products Health Postures designs and manufactures include dual monitor sit stand work stations, adjustable mouse stands, dual monitor arm accessories, Stance move seat extensions, industrial surface Taskmates and Stance Move chairs. For more than five years, Ergo Design Solutions has been providing expert ergonomics design solutions for corporate, group and individual clients located in New York City and other regions of the United States. A primary purpose of Ergo Design Solutions is to help alleviate people's neck, back and spine issues using workplace ergonomic equipment and furniture designs. Among the company's solutions are electronically adjustable desk and monitor equipment. Ergo Design Solutions also offers manually adjusted workplace furniture and equipment like keyboards, monitors, keyboard trays, tables and monitor mounts.